I’m sure we all know the feeling of fatigue that causes one to say, “I just feel like I’m sucking wind.” If the fatigue is brought on by physical exhaustion then a season of rest and a good night’s sleep will bring much needed refreshment. However, we often suffer from a different kind of fatigue that is harder to pinpoint. Perhaps we are not even aware of it’s deteriorating effects in our lives. This is the fatigue of life brought about by a spirit of discontentment. I have recently been reading The Rare Jewel of Christian Contentment by Jeremiah Burroughs. Written by an English Puritan and published in 1648, I expected this work to be difficult and laborious to read. How wrong my initial assumptions! Burroughs is full of wit and wisdom that press home the great mystery of contentment. What I found most surprising is his consistent use of illustrations to help explain the point being made. As he teases out the subtle nuances of contentment, he carefully illustrates each point to make it even more accessible. Such an illustration sheds light on the madness of the situation. We can clearly see the foolishness of a man gulping in air and simultaneously complaining that he is starving! He doesn’t need more wind, his stomach wasn’t designed for it. He needs food! How true for us as well. Yet so often we find ourselves fatigued from chasing after the things of this life assuming that they will bring satisfaction. Contentment will never be found in having more riches, success, power, ability or influence. As Burroughs states, “When a soul comes into the school of Jesus Christ, and there comes to see vanity in all things in the world, then such a soul comes to have contentment. If you seek contentment elsewhere…you seek for rest but find none.” Sucking wind? Perhaps you have been seeking contentment in that which will never satisfy because your soul will only find its rest in God. C.S. Lewis famously said, “it would seem that our Lord finds our desires not too strong, but too weak…we are far too easily pleased.” It was around this time last year that one of my nieces had a birthday party at one of those venues that hosts children’s birthday parties. Their specialty was bounce houses. 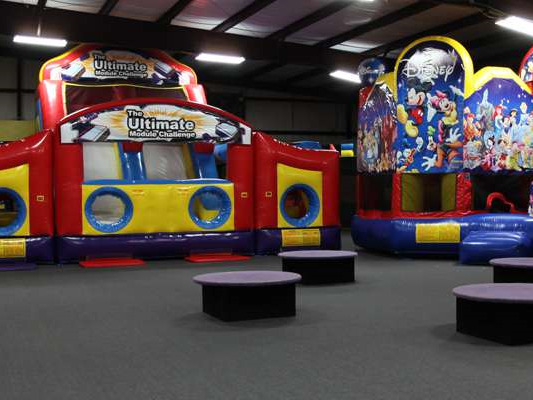 They had an enormous room filled with inflatable bounce houses; giant slides, obstacle courses, and more bounce houses. It’s every little kids’ dream! However, before the kids were allowed to enter the room, they had to watch a short introductory video on proper behavior and safety issues. All of the children sat in rapt attention watching this video of kids having the time of their lives running and bouncing and playing with one another. As the video drew to an end you could feel the excitement in the air as all of the kids realized that their time to play had finally arrived. When the video ended, the doors opened, and all of the kids ran into the room for their chance to play. However, as I watched this scene unfold one little boy, my then one and a half year old son, had no idea what was happening. Instead of jumping up and running, he sat in his spot sobbing uncontrollably. He was having so much fun watching the video with so many of his friends and cousins sitting around him. The kids on the TV having so much fun fully enamored him. He never connected the reality that the whole video experience was preparation for him getting to go and play in that very room where all of the other boys and girls were having so much fun. I had to pick him up and carry him into the room so he could finally take part in the fun. The whole scene, which happened in the space of mere minutes, is such a picture of what our lives are often like. We are far too easily pleased with what the world has to offer that we never consider there could be a greater reality, a greater enjoyment, greater pleasures at God’s right hand. Jesus commanded his followers to take up their cross and follow Him. Sometimes, oftentimes, he calls us to sacrifice the very things that bring so much joy and pleasure. The sacrifice often feels like a certain kind of death, which is why our Lord said, ‘take up your cross.’ However, as we grow in our union with Christ, we find that our Lord makes amends for these losses. It’s why he told Peter in Matthew 19:29, “And everyone who has left houses or brothers or sisters or fathers or mothers or children or lands for my name’s sake, will receive a hundredfold and will inherit eternal life.” I have no doubt that some are called to carry bigger crosses than others. I also believe there are seasons in our lives where the cross we hoist is heavier than at other times. If only the duration were minutes and not years. How does one endure such cross bearing? One way is by realizing the truth of the apostle Paul’s words, “This light and momentary affliction is preparing for us an eternal weight of glory beyond all comparison, as we look not to the things that are seen but to the things that are unseen. For the things that are seen are transient, the things that are unseen are eternal.” Don’t be so easily pleased that you miss the truth of these words for the sake of temporary relief. Why does this matter? It is so easy to get frustrated when someone interrupts my schedule. The disruptions and interruptions that take up “my time” often lead to unnecessary frustration, even anger, and we never realize that the time “lost” wasn’t ours to begin with. Not only does this apply to interruptions, but also to the daily menial tasks that take up time. In reality they haven’t “stolen” my time because it wasn’t mine in the beginning. God is the creator of time and He is the one who rules and overrules the time, even our daily calendar. While we are the recipients of 24 hours each day, God is free to edit my calendar each day. How often this happens! However, the reality is how much more patient and long-suffering would we be if we lived out the principle that “my time” is not my own. Rather than angry, hurried, and rushed, we would find joy, peace, and patience. For the past few years I have made regular use of the devotional Voices from the Past. It is a collection of daily readings taken from some of the great writings of the Puritans and has provided me great sustenance in my daily walk with Christ. Consider this great quote from Thomas Brooks in one of this week’s readings: “One of Satan’s devices to draw the soul into sin is to present the bait, and hide the hook; to present the golden cup, and hide the poison; to present the sweet, and the pleasure, but hide from the soul the wrath and misery that will certainly follow.” When in the throes of temptation, sin seems so appealing. Sin offers promises that it will never fulfill; promises of security, acceptance, knowledge, pleasure, and more. Satan’s promise to Eve in Genesis was that by eating the fruit of the tree of the knowledge of good and evil, she would be like God. She would be brought in the know, her status would be elevated, and she would find fulfillment in the action. But embedded deep in that fruit was a hook that Eve didn’t see. If we could only change our perspective with sin and see the hidden danger, sin’s luster would quickly tarnish. How different Eve’s perspective would have been if she had viewed that fruit as laced with poison that would destroy her soul. Too often we view sin as if it’s an oasis in the middle of a desert that will bring relief from the heat of the day. If we knew that the pool of water was filled with bacteria and disease not only would we never linger at it’s edges, but we would keep a wide path to avoid its borders. As we battle temptation, we will do well to remember that Satan loves to present the bait but hide the hook. 1. Irreversible – Once labor begins, the baby is coming. There is no turning back! This is the thrust of Paul’s argument here in 1 Thessalonians. Once Christ returns, it’s too late. Either one is prepared for his return or they are not. There is no second chance to get ready. 3. Preparedness – Since 1 and 2 hold true, how foolish it would be to be unprepared. If Christ’s return is irreversible and can come at any moment, how foolish it would be to be unprepared. It would be as foolish as having a wife who is 9 months pregnant and not even thinking about making plans for the baby to come. While the baby’s arrival may be a surprise in one sense, in another sense we should be expecting his coming and preparing ourselves for his arrival. 4. Urgency – Since the baby can come at any moment and all the preparations are in place, there is now an urgency to what I need to do. Instead of sitting home and doing nothing, I now have a laundry list of tasks to complete hopefully before the baby arrives. In many ways I work with one eye on my phone and another on the task at hand. So too in God’s economy, there is an urgency to the work that He gives us to accomplish. As Christians we don’t become passive waiting for Christ’s return, but we become even more active and diligent in the work that lies before us. So while I wait for the call that the baby is on the way, our bags are packed and ready to go. Everything (as much as we can plan) is in place and we continue about the task at hand. And so too, God calls us to be prepared, to work diligently knowing that Jesus can return as unexpectedly as labor pains on a pregnant woman. This spring semester in RUF we will be studying the life of David on Tuesday nights. One of the most well known and complex men of the Old Testament, David is also one of the most misunderstood. Here are three reasons why we are committing a whole semester to studying the life of David. 1. To Better Understand Jesus. Jesus’ title as Son of David is not a random title taken from an Old Testament character, but one that speaks volumes in terms of Jesus’ identity as the true king of Israel who has come to save God’s people. Throughout the New Testament the crowds (Matthew 12), the disciples (Matthew 1), the children (Matthew 21), and the broken (Luke 18) find hope in the reality that Jesus was the true son of David. Primarily, we will be studying the life of David with an eye towards the greater fulfillment that has come in Christ. 2. To Better Understand the Christian Life. More material is devoted to the life of David than nearly any other character in the Old Testament. We see David at his best and worst, living faithfully and in sin, as a child and as a father, as a servant and as a king. David’s recorded life runs the spectrum of life’s ups and downs. There is much we can learn from his life, his decisions and his response to challenges as we seek to live all of life in God’s presence. I’m looking forward to diving into the life of David this semester. I hope you will join us on Tuesday nights!